On June 18, the Sarasota City Commission is scheduled to review the draft of an ordinance that will set in motion a Nov. 6 referendum on whether citizens wish to change the dates of the city elections. 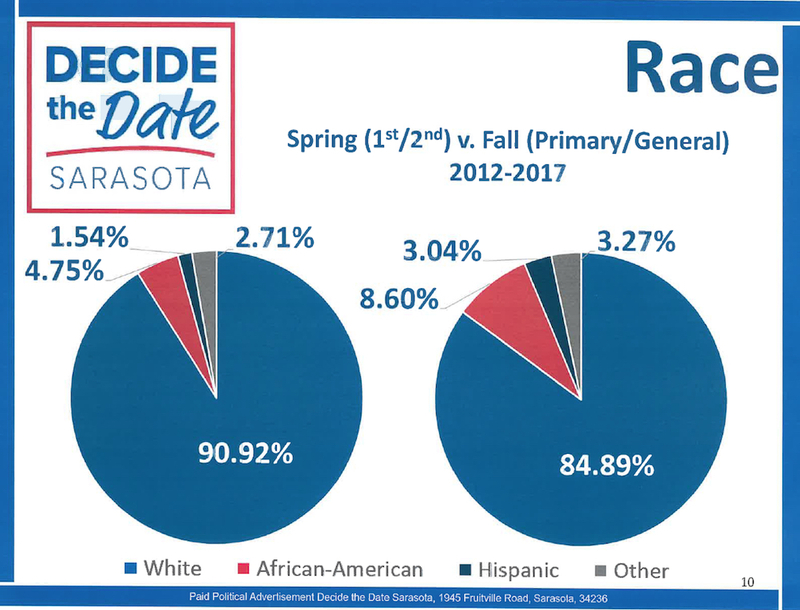 On a June 4 motion by Commissioner Willie Shaw, seconded by Commissioner Shelli Freeland Eddie, the board accepted the report of representatives of the organization Decide the Date Sarasota, which conducted a petition drive to get the proposed measure on the General Election ballot this year. He added that he hopes the initiative will lead to greater voter participation. With the group’s having met — and, in fact, exceeded — the required number of signatures in the petition drive, City Auditor and Clerk Pamela Nadalini explained at the outset of the discussion that the issue was before the board that night for the next steps. Article X of the Sarasota City Charter calls for the City Commission to adopt an ordinance within 60 days after a petition for a charter amendment has been submitted to the board with certification that it has met the necessary signature threshold. The ordinance must provide for the date of the referendum and include the summary of the amendment that will appear on the ballot, City Attorney Robert Fournier pointed out. That ordinance also must provide an effective date for the amendment to go into effect, if it wins voter approval. One significant issue with the Decide the Date referendum, he noted, is that the commissioners will have to decide how the shift in the elections will be handled, if the initiative wins voter approval. That implementation process will have to be part of the ordinance, he said. Begun on Dec. 12, 2017, the Decide the Date Sarasota petition drive concluded on May 11, Co-Chair Suzanne Atwell pointed out during remarks to the commissioners on June 4. The drive collected 996 more signatures than the 3,736 required for the measure to go on the ballot. 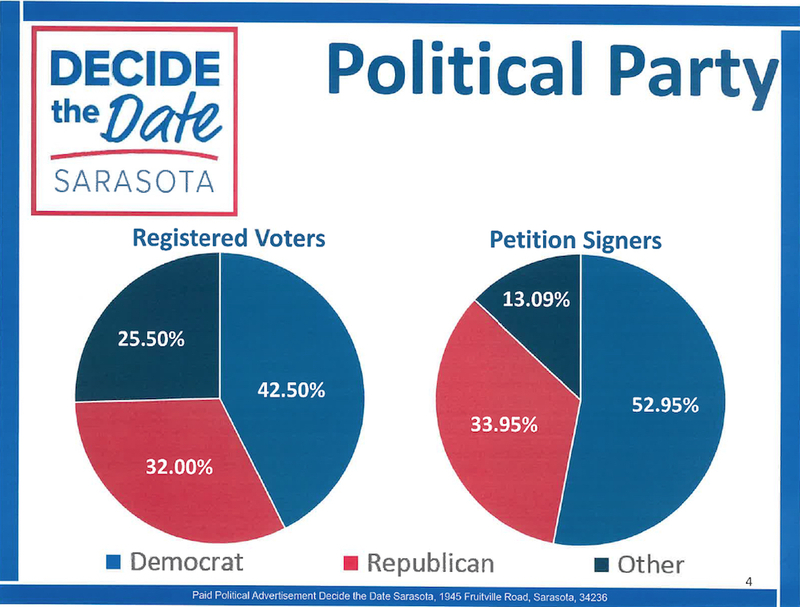 As she and Co-Chair Larry Eger, public defender for the 12thJudicial Circuit, have done since the petition drive began, Atwell referenced voter participation figures for the spring elections compared to those in November to explain the organization’s desire for a switch in the dates. With final city elections in November, she said, voter turnout will rise from 15% to 23% to 50% to 72%, based on statistics from the Sarasota County Supervisor of Elections Office. As Atwell explained it, Decide the Date proposes that if more than two people are running for the city’s district seats, the primary would be held in August. Then, the top two vote getters would advance to the November General Election. ‘There is no ability to outright win the election in the primary,” she emphasized. Commissioner Hagen Brody disputed Chapman’s figures, citing statistics he had gathered from the Supervisor of Elections Office. The last August primaries had overall voter turnout of 24.4%, he said, which was higher than the figures for the March and May city elections in 2017, when he and Vice Mayor Jen Ahearn-Koch were elected. In March 2017, voter turnout for the at-large City Commission election was 19.14%, the Supervisor of Elections records show; in May 2017, it was 22.86%. 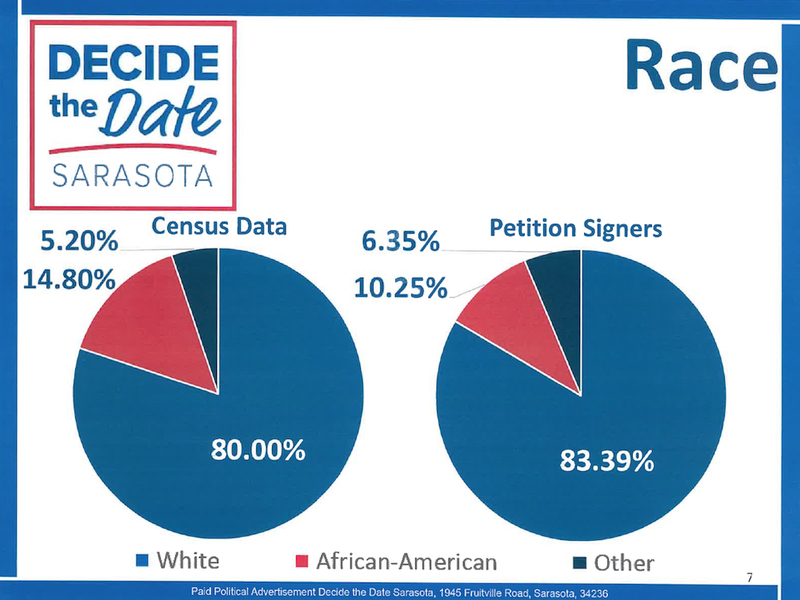 Kevin Cooper, president and CEO of the Greater Sarasota Chamber of Commerce — who served as treasurer for Decide the Date Sarasota — also addressed the commissioners on June 4, providing data to illustrate the demographics of the petition drive compared with voter data for the city. “Overwhelmingly,” he said, 52.95% of the people who signed the petition were registered Democrats; 33.95% were Republicans; and the other 13.09% comprised Libertarians, those with no party affiliation and others. Data for the city’s registered voters, he continued, showed that 42.5% are Democrats; 32%, Republicans; and 25.5% represent other parties or those with no party affiliation. “It’s pretty representational,” he pointed out of the petition drive. “The city itself is just predominantly Democrat,” Cooper added. As for the race breakdown for signers of the petition: 83.39% were white; 10.25%, African-American; 2.77%, Hispanic; and 3.58%, other. Census data show the city’s population to be 80% white, Cooper said, with 14.8% of the people African-American; and 5.2% representing other races. Yet, in the city’s spring elections, Cooper pointed out, an average of 90.92% of voters were white between 2012 and 2017, compared to 84.89% in the November elections. The percentage of African-American voters in the spring averaged 4.75%, compared to 8.6% in November; and the Hispanic average in the spring was 1.54%, compared to 3.04% in November. He also cited data showing that the majority of registered voters — 42.84% — live in the city’s District 2; 50.82% of the petition signers also live in that district. He had no information to explain the breakdown of voters by district, he added, suggesting that that should be fodder for a future commission discussion.